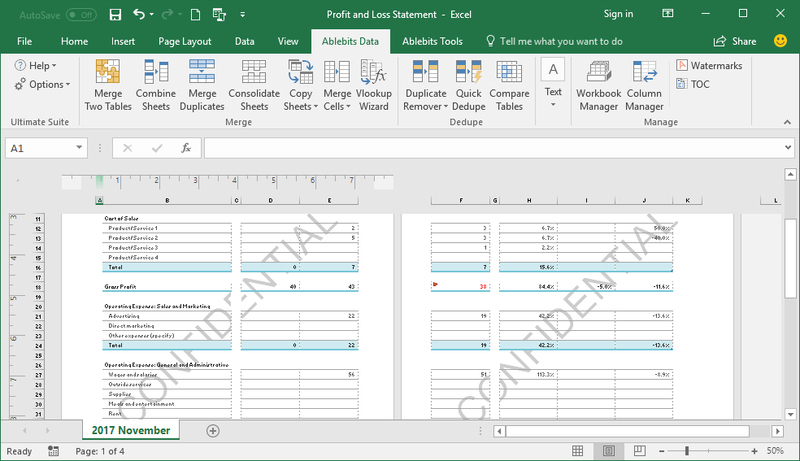 Whether you want to prepare your tables for printing, identify the owner or the status of the document, or simply protect the information, Watermark in Excel will help you. With this add-in, you can insert and remove built-in watermarks as well as quickly create, save, and edit your own ones. Create new watermarks Name your watermark, make it look like a picture or text, and adjust its settings to use it right away. Use text in your watermark Enter any text you want, set the font, change its size and color, decide whether it should be transparent and diagonal. Turn a picture into a watermark Select a picture from your PC and check the option to make it transparent if needed. 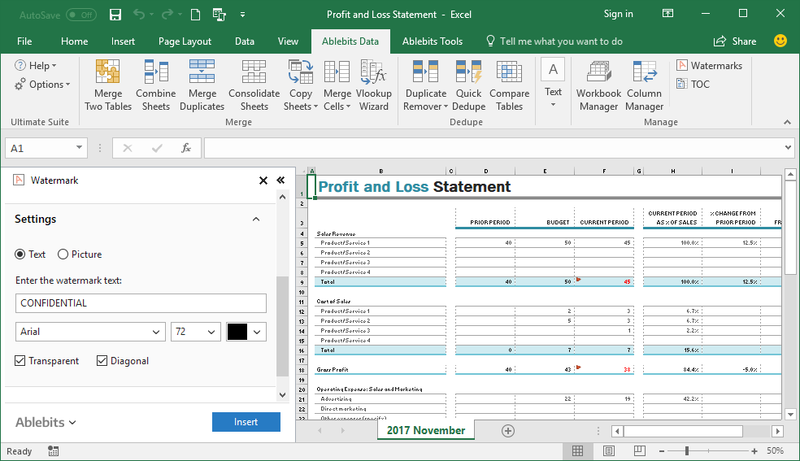 Insert watermark in Excel and delete it in a snap Open your workbook, run the add-in, and click one button to either Insert or Remove the watermark. What is Watermark and what do I need it for? 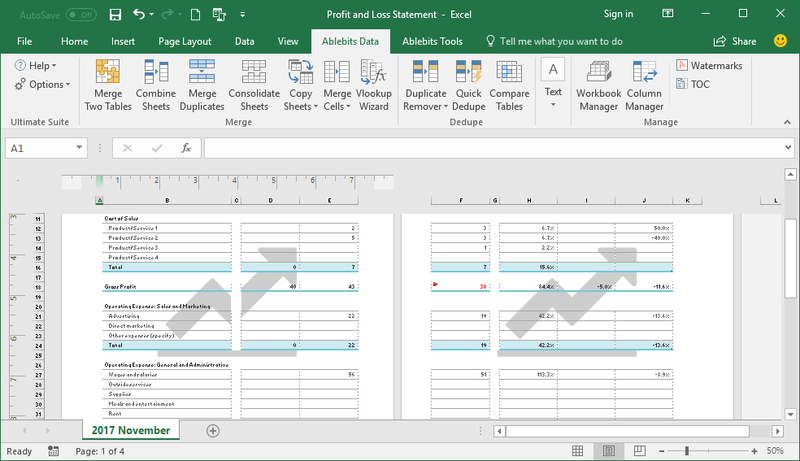 The Watermark add-in allows you to add, store, insert, and remove watermarks in Excel. With its help you're able to create your watermarks, edit the existent ones, keep them at one place, and delete those you no longer need. There's no built-in watermark feature in Excel. Yes, you could try working with Header & Footer Tools to add a picture to one of the edges of the sheet. But you'll have to go over the same steps on each sheet within a workbook. Also, it's impossible to use text in header and footer. Our add-in creates watermarks from pictures as well as from text. The process of adding a watermark to every worksheet is reduced to a couple of mouse clicks. Choose a watermark from the list or create a new one. Enter the text and choose its font, size, and color. Decide whether it should be transparent and diagonal. Browse for another picture on your PC if necessary. Decide whether it should be transparent. Click the Insert button and get the result immediately. What if the watermark doesn't look as I expected? Can I change it right away? Sure, just remove the watermark from the sheet, change its settings or select a completely different watermark on the add-in pane, and insert it again. Will I be able to print my table with this watermark? Of course. Go to Print Preview and you'll see what will be printed - watermark included. Will I see the watermark on computers without the add-in? Yes, you will. Once the watermark is added, it becomes a part of your document. You will see it on any device that can open Excel files. However, you won't be able to edit or delete the watermark from the file. What picture formats are supported by Watermark? Our add-in supports the most popular picture formats: BMP, DIB, RLE, JPG, JPEG, JPE, JFIF, GIF, TIF, TIFF, and PNG.